Our customers' desires are our focus, and our attention to detail is our foundation; every event we craft is a one-of-a-kind creation. We believe that your wedding or special event should embrace your style and vision, and we do everything possible to make that happen. We will coordinate every aspect of your wedding or special event, from creating and managing budgets and timelines, researching and negotiating with vendors, assisting with event design, comparing prices, reviewing contracts, preparing wedding planning checklists, wedding day timelines and floor plans, to overseeing all vendors and activities on the day itself. What can Bella Celebrations do for you? Give you time to enjoy your engagement. We understand that today's dual career couples often cannot fit wedding planning into their daily schedules. The average wedding can take up to 250 hours just to plan. Planning weddings and events is what we do. We devote ourselves completely to your event - managing every detail leading up to the event itself. 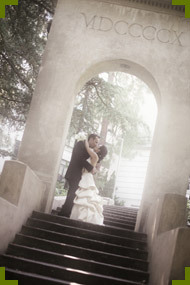 You want to know that your wedding plans are on schedule, within budget, and under control. We help to take the stress out of the planning process. Put you in the spotlight. On your Big Day, nothing happens on its own. Someone has to produce it and make the right decisions. And if you're lucky, that someone will be Dina. All material copyright © 2007 Bella Celebrations or their respective owners. Website development by ISPOT Interactive.